There have been a lot of challenges that I’ve overcome. 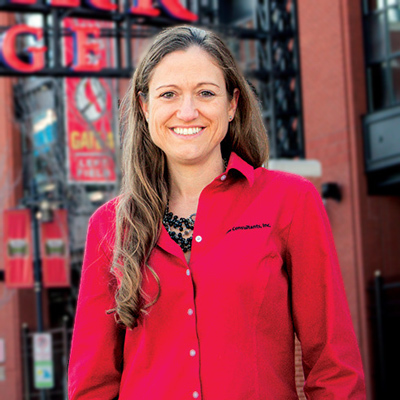 When Amy Murdock, Principal at Code Consultants, Inc. (pictured above at Ballpark Village in St. Louis, MO) first started college in the Department of Fire Protection Engineering (FPE) she moved into a nearby firehouse – this housing experience was personally arranged by FPE Professor and Founding Chair, John Bryan. FPE is small, and Murdock found herself within an even smaller cadre of students: women. Men and women communicate differFPE ently, she noted, adding that women tend to excel at verbalizing complex scenarios. But sometimes they don’t speak up as much as men, she said. During school, Murdock “leaned in” by assisting with the management and maintenance of FPE lab equipment, working in the department office, and interning with a local FPE firm. If it had not been for Bryan personally recruiting her in the mid-90s, Murdock would not have known it was possible for her to obtain in-state tuition due to a reciprocity agreement at that time with her home state of Virginia. The recruitment also entailed FPE Professor and Chair James Milke phoning her father to relate what the program had to offer. Department administrators and faculty directly engaging on behalf of a student for everything from tuition assistance to housing shows how caring the FPE department is, Murdock noted. “That’s the kind of family you have in fire protection,” she said. Subsequently, Murdock is devoted to giving back to the program to pay forward the generosity she received while at UMD. In the industry, there is a running joke about the “Maryland Mafia” of fire protection engineers. Currently, she serves on FPE’s Engineering Board of Visitors and Curriculum Advisory Committee, and is a donor to the department’s Legacy Campaign for a Professor of Practice, which brings hands-on field experience to the undergraduate curriculum. Inspired by her professors’ open door policy, Murdock herself now offers that openness to other engineers seeking career advice, especially other women.